I am still feeling a buzz from last night’s concert. It was so much more than a concert. It was a revival meeting, for baby boomers. My daughters knew I needed it. When they heard I had looked at tickets on line, then shut my computer knowing that amount of money, this time of year, on myself. No way. So they contacted some of my true-blue loyal students and friends, and raised the money to send their mother to see Fleetwood Mac. My Christmas present. The message I received at the concert was that we cannot stop sharing the gifts we have. We cannot let age deter us from doing what we love to do. We know why we came, so don’t stop. And she didn’t want to just come back to perform, she wanted to come back and be better than ever. She is. She looked better than ever, she sounded better than ever. They all did. And so can everyone. Come out of your hiding place and be better than ever. This new year, don’t get ‘back in shape,’ instead make the intention to get into the best shape of your life. This new year, don’t decide you want to fix your finances. Instead make the intention to have your best year ever. Don’t look behind you to decide what you want to do in front of you. Decide you will do more, share more, be more and let yourself open up to be more than you have ever been before. And she reminded everyone that you do have to work hard to make dreams come true…but be willing to do that! After all these years, these people have come full circle. They are older, wiser, and more talented than ever. Each of us can learn to ‘think youthful’ as Lindsey said, and go forward with a new energy. Dance more, sing more, celebrate more. And do it with enthusiasm! Be the Rock Star you came to be! 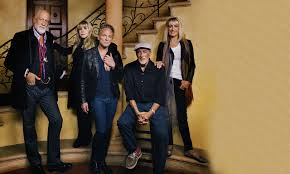 Keep believing in your dreams…Stevie says Fleetwood Mac is proof that dreams do come true. Fleetwood Mac got me high again. This time I am high on the truth of who I am and what I came to do. It’s a good high. It’s a rock star high. Be high on the truth of who you are…and do what you came to do.